Visit all of Santa Cruz' top spots in one day on this day trip from Tenerife. Follow your guide through the streets of Santa Cruz as you explore neighborhoods and learn about the history and culture of each area. Sights to see along the way include the Auditorium of Tenerife and Plaza de España. Get picked up early for your day trip to Santa Cruz. Please check ahead of time to make sure your hotel is one of the ones this service provider will pick up from. You might have to ask them to add your hotel to the lineup for you. Board an air-conditioned coach and relax on the journey to Santa Cruz, known for its island culture and rich history that dates back to the 15th century. Your guide will keep you entertained with information as you go. On arrival, it’s time to follow your guide on an adventure through the city’s different neighborhoods, including San Jose, the Zona Centro, and Zona Rambla. Stroll along the streets lined with boutiques and cafes. Your guide gets you more acquainted with this coastal island city and fills you in on its history, culture, and some fun facts. A trip to Santa Cruz just wouldn’t be complete without seeing some of its most popular attractions. 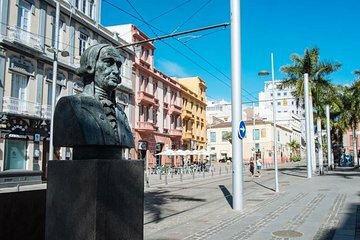 Admire the Auditorium of Tenerife, the Cabildo de Tenerife, Plaza de España, and the Marine Park before you get back in your vehicle for the ride back to your hotel.